You must definitely add Barcelona, the Bold – Spain to your bucket list. Hello and thanks for traveling with us again. It’s Paul Scopel here with You, Me and The Dock. I have been absent for awhile with my travels. But I am back and ready to tell you about Barcelona. One of my favorite cities in Barcelona is the Catalunya (pronounced; Catalonia) community. All you need to do is mix the ingredients of art nouveau design with the combined styles of Paris and New Orleans, add the Mediterranean fed Balearic Sea, and you have the beautiful makings of a fabulous city. Let me share with you the intricacies that I found in this world class tourist destination. Barcelona is not shy about attracting attention or people to itself. Over the centuries it has hosted Summer Olympics, the 1888 and 1929 World fairs, and launched global explorers. Each event has left its mark on the city giving it a charm and warmth like the turning of pages in your favorite novel. The metro area is home to 4 million people. Like the waves of the Mediterranean sea, undulated history has washed over the city with distinct districts that feature separate layers of architecture, art and cultures. 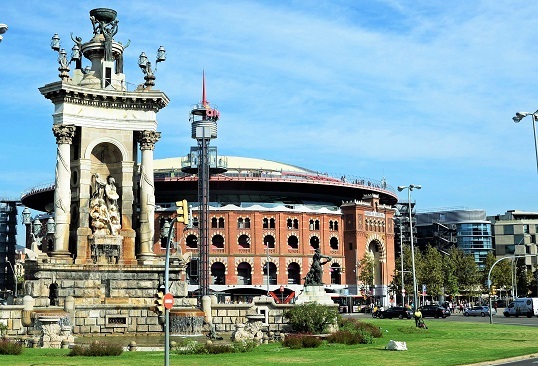 The centerpiece of Barcelona is “Placa de Catalunya” (shown right), a huge open square covering about 4 city blocks. This park serves as the city’s transportation hub which includes bus tours, city buses, subway, taxis and airport shuttles. 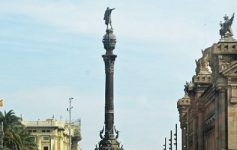 It is perfect to use as a focal point to orient yourself to the city as it separates old and new Barcelona. We begin at the 12 o’clock point of this plaza to explore the newer Eixample Barrio. The “Newer” is a relative term as the Eixample was developed in the 1850’s to provide space and order to a bursting Barcelona. 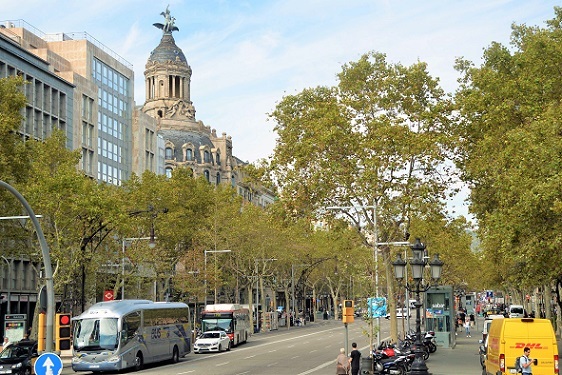 Two key streets running north in the Eixample are Passeig de Gracia (the shopping street), and La Rambla de Catalunya (the eating street). Eixample begun to grow immensely through the latter half of the 19th century. 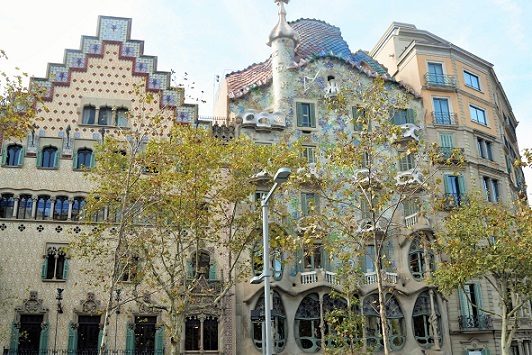 Wave after wave of unique buildings in the Modernisme (art nouveau style; shown upper – right) neighborhood were birthed during this renaissance of Catalunya. Modernisme is a flamboyant taste in modern art, architecture and literature. 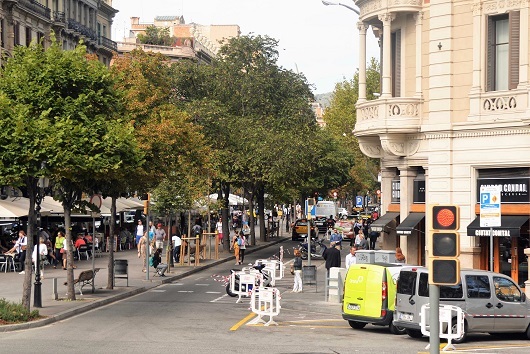 As an example in the Eixample, innovative designers cut the corners off of every city block resulting in continuous buildings having 8 sides on the block. 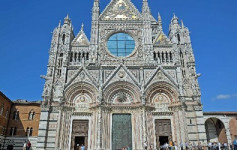 It is captivating with the tree lined streets, splendid balconies, and 8-sided pedestrian squares at each intersection. I spent much of my time venturing around these magical blocks that make up this very distinctive area. Passeig de Gracia is the main shopping street. Its wide avenue is bordered by two – one way service streets that provide pedestrian and service vehicle access. A multitude of local residents and tourist traverse to this beautiful upscale shopping mecca. 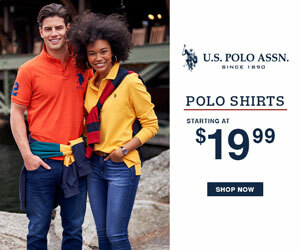 Many of the stores are easily found on California’s famous Rodeo Drive. On Passeig de Gracia, I found one of my favorite restaurants. 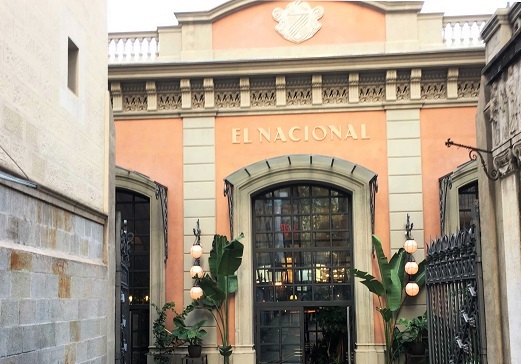 The El Nacional is known for its authentic cuisines served in a traditional setting. There are many stunning restaurants and bars featuring fish, steak, pasta, and desserts all under one roof. Right next door is QuQu tapas café which offers tapas (Spanish appetizers) all day, and a variety of meals with locally grown ingredients. 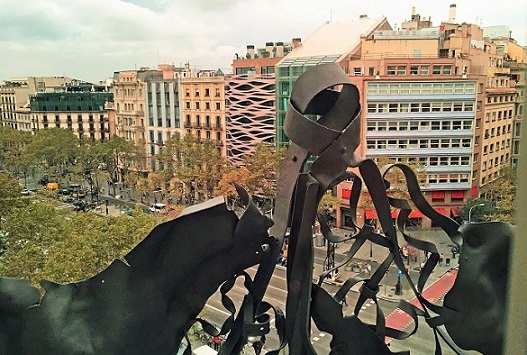 On Passeig de Gracia there are some main tourist sites which include Casa Mila and the nearby Block of Discord. The Block of Discord is a city block long collection of curvy Modernisme building facades vying for your attention and acceptance. In Barcelona the Modernisme – art nouveau school of architecture and design, exploded as Antoni Gaudi and others led the Catalan movement during the late 1800’s to early 1900’s. 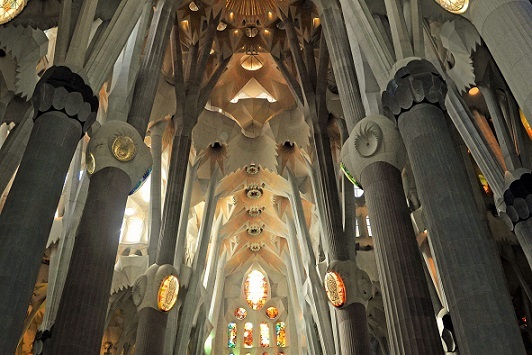 Our term “Gaudy Looking” stems from Gaudi’s name and works. One look at his brilliant creations and you will understand. The liberal use of ceramics, stained glass, wrought ironwork forging, color, shapes, and carpentry are woven into masterpieces for buildings around the city. I visited four of Gaudi’s awesome creations. Casa Mila (a.k.a La Pedrera or Stone Quarry), Parc Guell, Sagrada Familia church, and Casa Batllo (pictured upper – right) in the Block of Discord. The surreal roof line and tiles of Casa Batllo appear to be scales on the cresting back of a dragon representing the Biblical battle of St. George slaying the dragon. Casa Mila (pictured right) is a fortress of apartments four streets away from the Block of Discord. It grabs your attention with its swirled ice cream looking chimneys. Each floor has four apartments that are dissected by two huge open-air shafts in the center from the roof to the first floor. These shafts allow maximum light and air to the apartments. Your ticket allows admission to the roof with its unique chimneys and city views. 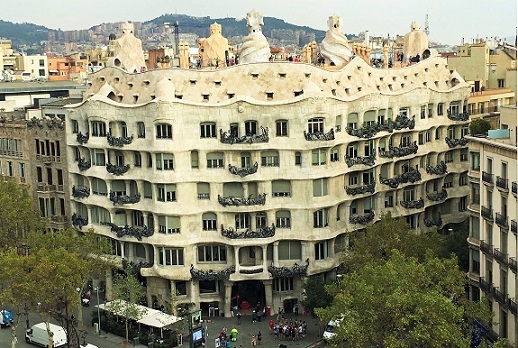 Gaudi proclaimed that conventional roof tops are ugly and resemble bald heads with a single hair. His creations of waves, spires, armies of chimneys and ventilation shafts are an architectural treat. At night a special light and music show turns the roof lines into an ethereal dreamland. 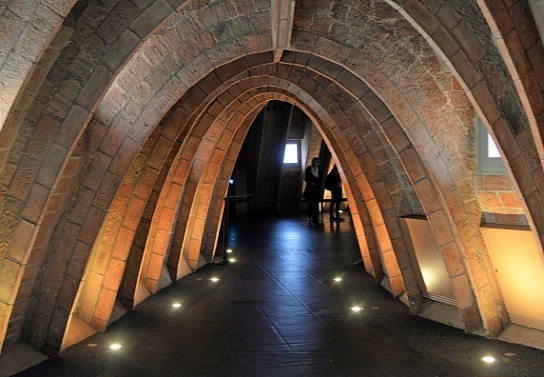 In the accessible attic is an interesting Gaudi museum that describes his techniques. The attic (pictured left) served as storage and laundry areas for the tenants. 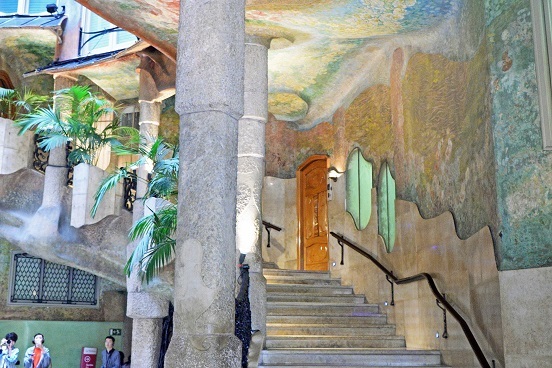 Gaudi sought to incorporate glimpses of nature in Casa Mila. He fashioned the exterior and interior walls, balconies, and ceilings with very elaborate designs. 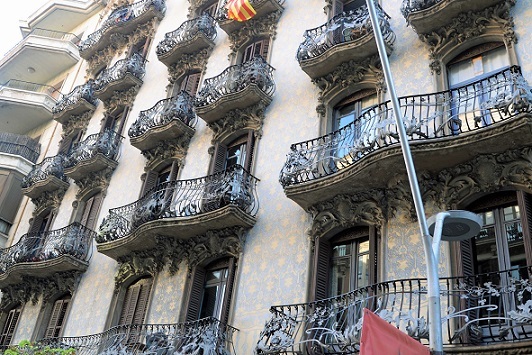 Gaudi also created the wrought iron art (shown lower – left) that resembles seaweed on the building’s balconies. The artist phrased a slogan that said, “There are no straight lines in nature” as he appropriated these themes into his works. There is a beautifully designed stairway (pictured below – right) on the first floor that leads to a most unusual residence. To save time and not have to wait in long lines, we again purchased tickets ahead of time by googling Casa Mila. 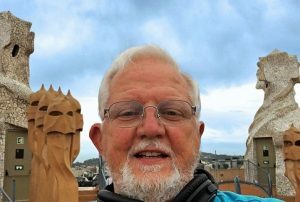 From the rooftop of Casa Mila you can see Gaudi’s unfinished crowning achievement. 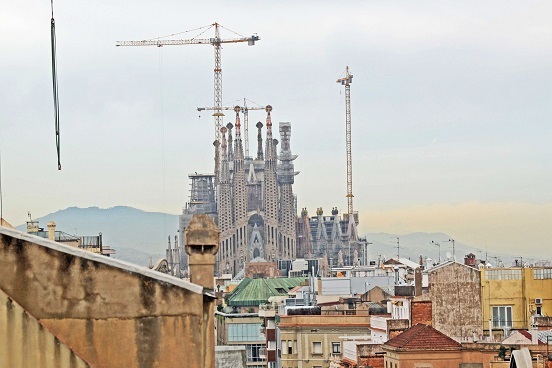 The monumental Sagrada Familia Church – translated; Holy Family Church, will still take lots of time to complete. From its beginnings in the 1880’s, the massive temple seats approximately 13,000 people and will not be totally completed until 2026. Eventually 18 towers will spring from the top of the church – 12 spires will represent the apostles, 4 for the Gospel writers Mark, Luke, John and Matthew, a larger tower to honor the Virgin Mary, and the tallest spire for the Lord Jesus. Each of the three facades (shown right) provide a glimpse of Jesus and his nativity, which portray his passion and his glory. The massive statues repeat in three different settings of the nativity and are seen from the eyes of Mary, Joseph, and Jesus. Inside the massive church (shown below – right), the monstrous tree like columns of stone support the delicate ceiling. Surrounding the upper deck is a 700 seat choir loft which rang out heavenly music when the pope came to consecrate the church. In spite of what you see today, it is hard to imagine that there is at least 10 more years remaining to complete this beautiful church. As I said before, purchase your tickets online in advance to avoid endless lines. This is clearly the number one tourist destination in Barcelona! 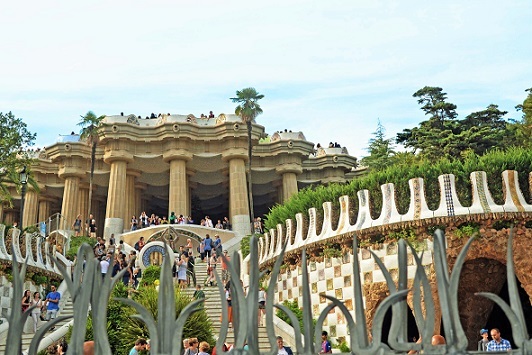 Another worthwhile Gaudi spot is Park Guell. 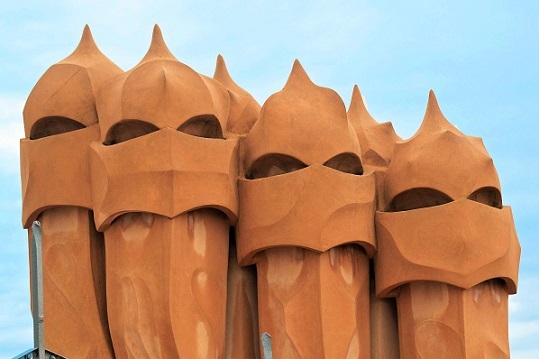 Gaudi was granted free rein in developing 45 acres of land to build a garden city with residences and a park. 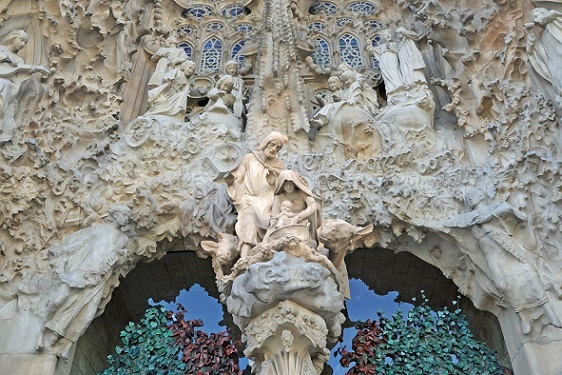 Letting loose with his creative flare and imagination, Gaudi completed the park. However, the development became a financial disaster. Today it is a worthwhile respite from all the city’s chaos. I recommend for you to observe the park from a tour bus, and return later by taxi for a longer visit. The tour bus stops at the park and then a steep one mile – uphill walk, followed by a lengthy ticket line. It is highly suggested to purchase your ticket(s) in advance. Running parallel to the Passeig de Gracia is La Rambla de Catalunya. This is a tree shaded, pedestrian only street of restaurants featuring indoor and outdoor seating. Do not confuse this with the Gothic style pedestrian street called “The La Ramblas”. It is hard to get lost in the Eixample. Don’t be afraid to venture out from these two streets and explore the stunning architecture and outdoor cafes. 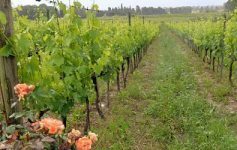 Literally stop and smell the roses, drink the coffee, sip the wine, and enjoy plates of tapas. On one occasion we enjoyed delicious tapas outdoors at a highly recommended restaurant named Ciudad Condal Cerveceria. 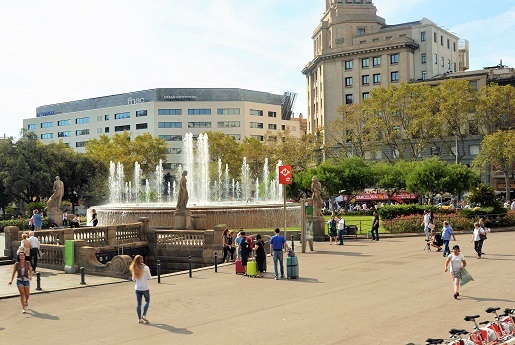 In my next Barcelona article – part 2, we will explore the area south of the central Placa de Catalunya. This will include the older Gothic area of Barcelona, the market, the beach, the Olympic area, and our favorite restaurant(s). I can’t wait to share the rest of my adventures with you. My one week in Barcelona is a treat I will never forget. Stay tuned!